Vegetarian shiitake mapo tofu! I will almost always order this if it’s on a menu and it’s also super easy to make at home. It’s traditionally made with minced meat but I love this mushroom version as well - to die for! Begin by thinly slicing your shiitake and grilling with a drizzle of sesame oil in a pan until browned through - about 10-15 minutes on all sides. While thats cooking, cube your block of tofu. Remove mushrooms. Add vegetable oil on medium high heat in the same skillet and add your aromatics: ginger, garlic, chili flakes and sichuan pepper flakes. Let the flavors combine and sizzle for 5-10 minutes. Add your cubed tofu, soy sauce, cornstarch, chili bean paste, fermented soy bean paste and sesame oil and mix well. Finally, add 1/3rd cup vegetable broth and mix to combine. Let all the flavors combine and wait for the mapo tofu to reduce from the broth and cornstarch (about 15-20 mins). Top with green onions and serve with white rice! Nashville hot cauliflower! Spiced with hot sauce, cayenne, chili powder and paprika. Made with a easy marinade of almond, white rice flour, vegan creamer and then baked in the oven. Topped with more spicy sauce and served with bread + pickles. Inspired by a meal favorite: nashville hot chicken which is a spicy fried chicken specialty from nashville that is SO good + this is my take on a vegan version. my dreams have officially came true. Preheat your oven 350 degrees. To begin, marinade your cauliflower in creamer, hot sauce, maple syrup, cayenne, chili powder, garlic powder, paprika, onion powder, oil, almond and white rice flour, tapioca flour and salt and pepper. Set aside for 30 minutes. Place on a baking sheet and crisp up in the oven for 1 hour until crisp throughout and cooked inside. In the meantime, make your sauce by mixing your spice mixture, hot sauce, maple syrup, oil and vinegar. Remove your cauliflower and mix with your sauce. Serve with bread and pickles! These tahini and oat cookies on my mind! Vegan, gluten-free + no refined sugars but tastes just as yums! Dipped in melted chocolate and topped with almonds. 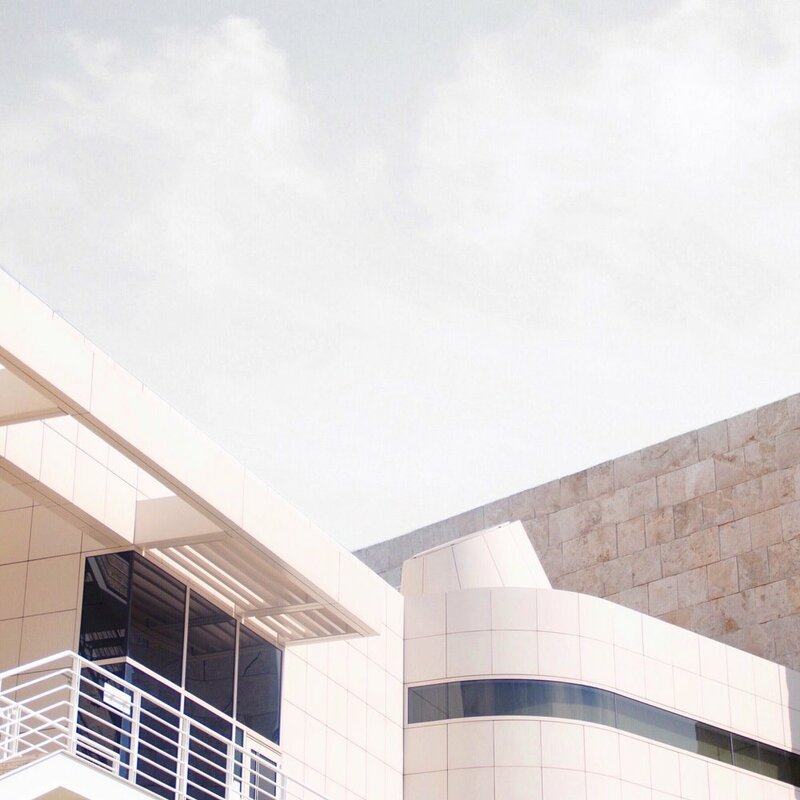 Minimum steps + super dreamy. Preheat your oven to 325 degrees. In a large mixing bowl, add your almond flour, oats and baking powder. In another bowl, mix your tahini, maple syrup, vegetable oil, vanilla extract and almondmilk. Add your wet ingredients to your dry ingredients and mix well. Add in 1/2 of your chocolate bar chunks and mix in. Set aside your cookie batter in the fridge for 30 minutes. In the meantime, melt your other half of the chocolate bar on a double broiler or in the microwave. Next, remove your batter and form cookies and place on a baking sheet. Bake for 20-30 minutes until golden brown and cooked through. Let rest and cool for 10 minutes. Dip 1/2 in chocolate and top with almonds. 8 ingredient dreamy, easy pz coconut stir fry noodles. this recipe literally goes on repeat for weekday lunches for me and it takes no time @ all. It's stir fried with chili oil and soy sauce and sautéd with shiitake mushrooms (my favorite) and green onions! Begin to boil your noodles according to the package instructions. Strain and set aside. Slice your mushrooms. In a pan, sauté and grill your shiitake mushrooms with soy sauce and sesame oil for about 15 minutes until they are grilled through. In the same pan, add back in your noodles. Mix with green onions, soy sauce, sesame oil, chili oil, sesame seeds and coconut milk. Let the flavors combine and stir for 3-4 minutes. Top with green onions and serve. Oh hello braised short rib tacos! I am seriously obsessed with how tender these short ribs turned out. For the braise, char your short ribs, remove, then place all the below ingredients in a pot, add your short rib back in and let it simmer for a few hours. I added in Autumn Glory apples for sweetness and a hint of cinnamon; the flavor & tenderness was unreal. Shred the short ribs and serve with a simple apple slaw using the Autumn Glory apples on the tacos. These apples are perfect for cooking in braises or stews to add extra flavor but are also just as good as a snack that you can have with your favorite dip (mine would be peanut butter or almond butter!) I particularly love them in this recipe because the apples become such an important part of the flavor because it adds most of the main seasonings that it's giving to the short ribs and helps them become extra tender for shredding. Begin by chopping your onions, apples and garlic. In a deep pot, char and cook your short ribs until all sides are a dark brown. Remove. In the same pot, add your onions, apple and garlic. Sweat out for 2-3 minutes on medium high heat. Add back in your short ribs and mix well. Next, add in your diced tomatoes, red wine, brown sugar, water and apple cider vinegar. Let this simmer on the stove on medium- low heat for about 2-3 hours until the short ribs are super tender. While that’s simmering, make your slaw by thinly slicing your apples and red onion. Place in a bowl with olive oil, mayo, lemon juice and salt and pepper. Once the short rib is tender, remove from the braising liquid and shred. Serve with your slaw on tortillas and your favorite taco toppings. Creamy, vegan roasted tomato basil soup! Roasted assorted tomatoes, onions and garlic then mixed with carrots, balsamic + more to create a luscious and delicious soup. Then blended with coconut milk and basil for ultimate creaminess. Heat your oven to 400 degrees. In a baking tray with parchment or oven proof pan, roast your tomatoes, onion and garlic with olive oil and salt and pepper for 30-45 minutes. Next, add your roasted mixture in a pot. Add carrots, balsamic vinegar, almond milk, vegetable broth, tomato paste and basil. Season with salt and pepper. Let it simmer and combine together for 30 minutes. Next, blend the soup mixture in a blender or a hand-blender. After it’s blended, add in your creamy coconut milk, adjust with salt and pepper. Stir well and serve. Life changing homemade hummus. The key: taking off the garbanzo bean shells for the creamiest hummus ever. Can’t wait to mix and match with diff flavors. Blend everything up in a food processor/blender + top with paprika and olive oil! 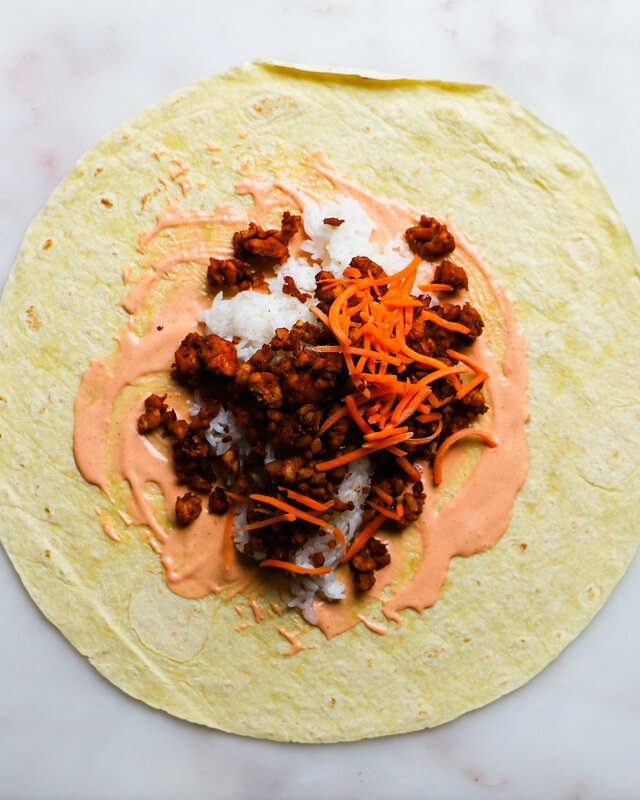 Korean bbq tempeh burritos! grilled with all my favorite seasonings and wrapped tightly inside a flour tortilla with herbs, rice and a spicy aoili sauce. YUM. 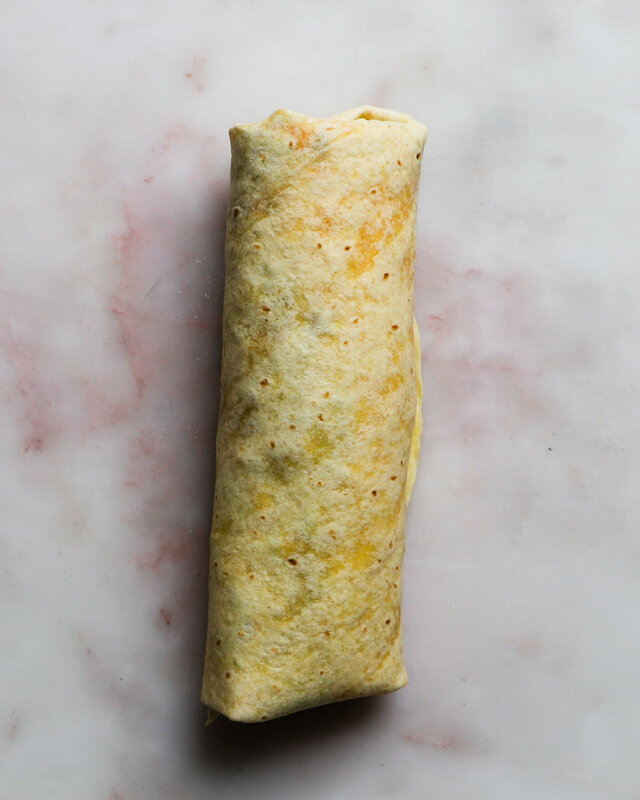 To begin your burrito, heat a skillet with a drizzle of olive oil. Crumble your tempeh and lightly crisp on medium-low heat for about 5-7 minutes. Next add your ingredients for the burrito by adding minced ginger, garlic, soy sauce, sesame oil, brown sugar, red pepper flakes or gochujang. Mix well and let all the flavors combine for 15-20 minutes. While that’s sautéing, make a sauce of your choice to drizzle in the burrito, prepare your shredded carrots, white rice, burrito wrap and herbs. 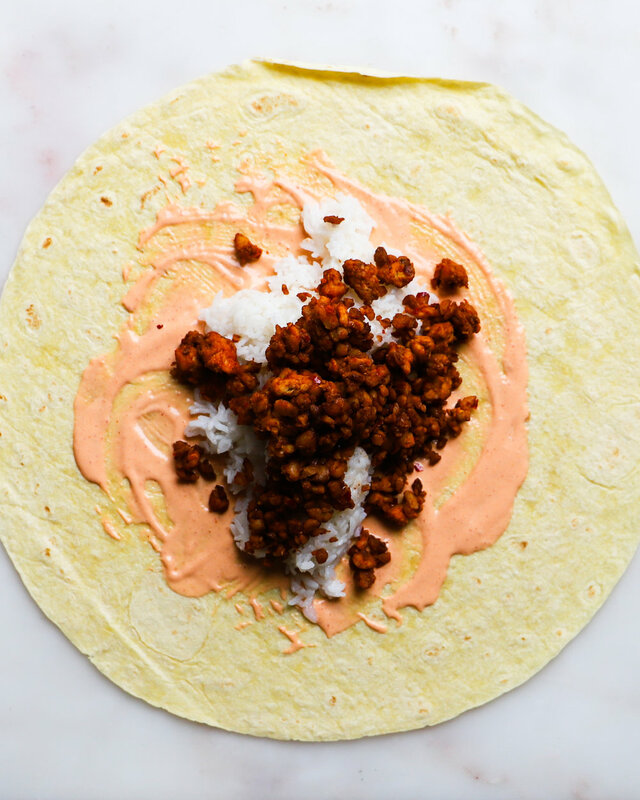 When your tempeh is ready, start to assemble your burrito by placing all the components inside and folding left and right inwards, and then in a folding motions upwards until the burrito wrapper is covering all the components. Close and hug tightly with parchment paper, slice and enjoy! THREE vegan dressings - roasted tomato tahini, green goddess + lemon dijon. Simple ingredients, quick to blend and made with a probiotic yogurt base. You can mix, match and add these on salads, wraps, sandwiches or anything else your heart desires. To make your dressings, take the above components of each dressing and place in a blender or food processor. Adjust with salt, pepper and lemon juice. Add more water to thin out if needed. Serve with grain bowls, on salads, wraps and more! I am obsessing over this fried goat cheese. It's soft on the inside and super crunchy on the outside from the panko crust - it's honestly what my dreams are made of. I also stuffed and served it with a tomato and ricotta pesto. I am in heaven! This is a super easy app to serve at a get together and party, or even just a fun snack for lunch or dinner. You can also choose to bake this in the oven for a healthier alternative. Season your panko and flour mixture with salt and pepper. Start by mixing your goat cheese with your tomato pesto. Next round out the goat cheese mixture into small balls. Next, roll the balls in your flour mixture, then dredge in your egg mixture and shake off excess. Finish off by mixing the balls in panko breadcrumbs. Hellloo indian butter chicken! So many spice goodies and can all be done in one pan! This dish is such an easy dinner meal that can be whipped in no time - it can also be meal prepped and re-warmed for the next night. Serve with your favorite yogurt sauce and some basmati rice. Cube your chicken and make your marinade by mixing with lemon, yogurt, salt, garlic, ginger and oil. next in a pan, grill your chicken with butter + oil until cooked through, remove from pan and set aside. In the same pan, add garam masala, garlic, chili powder, cardamon, salt, cumin and turmeric, stir for 1-2 minutes until all the flavors combine. add more butter, once melted, add your tomato paste, add water to thin out. Add your heavy cream and then add your cooked chicken back in. Stir until combined, plate + serve with rice. Walnut mushroom collard wraps on tonight's agenda! (and takes less than 30 minutes to make). Prep your favorite veg, make your mushroom mixture and wrap it up with a spicy tahini dressing. The mushroom and walnut mixture is such an amazing meat alternative and is SO filling, too. Blend or finely chop your walnuts and mushrooms. Place in a medium-hot skillet for 1-2 minutes. Add your garlic powder, paprika, chili powder, hot sauce, almond milk and nutritional yeast. Mix well and let the mushrooms and walnut sauté for 15-20 minutes. Set aside. In the meantime, in a bowl mix tahini, hot sauce, lemon juice, almond milk and salt for your dressing. Prep you wrap ingredients, stem your collard wraps and blanch in boiling water for 30 seconds. Slice your cucumbers, avocado and bell pepper. Assemble! 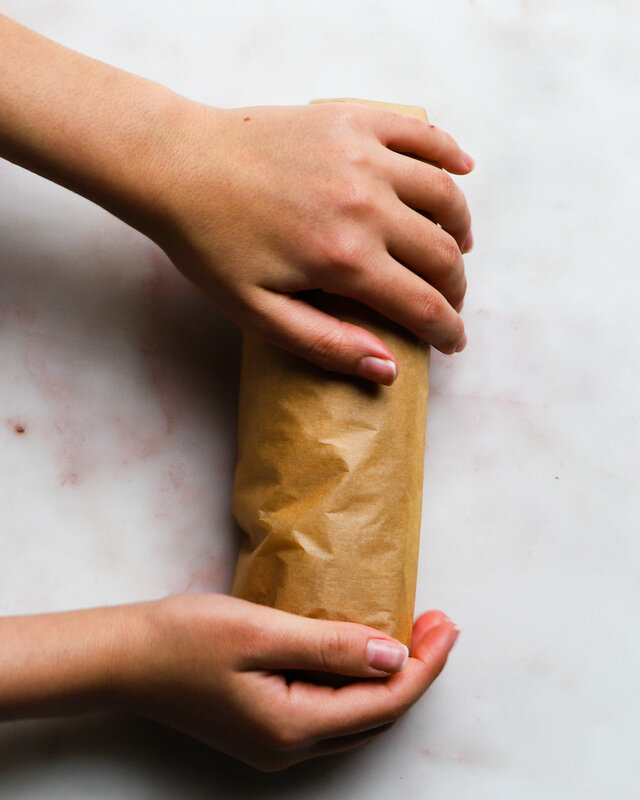 Add all your components for the wraps and wrap like a burrito. Slice in half and serve with the tahini dressing. Thai basil chicken! <3 the best quick and weeknight dinner! I also love to top my krapow with a crispy fried egg and let the yolk drizzle over the rice and chicken. 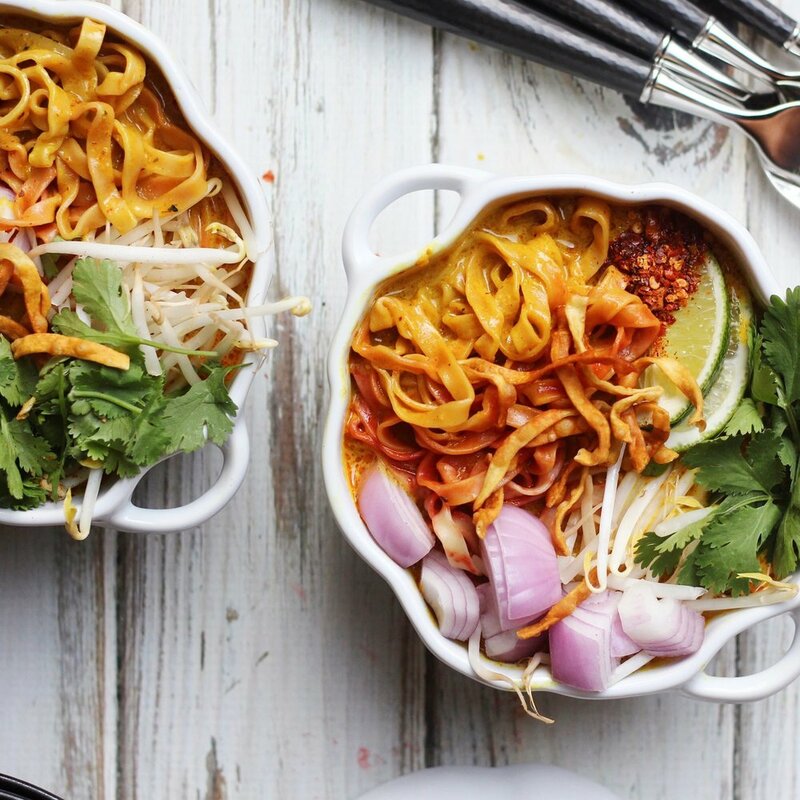 This is one of my favorite thai dishes as well and can be whipped up in no time! To begin make your stir fry sauce by mixing oyster, sauce, thai seasoning sauce and 2 teaspoons sugar. Set aside. In a pestal and mortar or blender (you can also finely chop), blend your garlic and birds eye chile, adjust with water as needed. Next, in a pan or wok, take your ground chicken and pound down until its crumbled. Let it crispy a bit and cook through for about 5-10 minutes. Add your stir fry sauce and garlic/chile blend and stir. Add your green beans in, then 1 teaspoon sugar and fish sauce. Let everything combine here for 10-15 minutes. Turn off the heat and add your basil and white pepper. Mix and serve with rice and a fried egg. All ingredients are from Milk and Eggs. Shop @ Milk and Eggs HERE. THIS za'atar + sumac rack of lamb with herb yogurt sauce may be my new favorite recipe. Super tender and a tangy marinade from the sumac - this recipe is my new go-to for rack of lamb. See below for the full recipe! Preheat your oven to 400 degrees. Next, make your yogurt sauce by blending your cilantro and dill first until chopped. Add your yogurt, lime juice, garlic, oil and salt and pepper. Blend and set aside. To make your lamb, mix za’atar, sumac, paprika, pepper, salt, garlic powder and oil in a bowl. Spread the mixture all over the lamb and let marinate for 30mins-overnight. Heat a skillet with a drizzle of oil and let it get really hot. Sear your lamb for 5-6 minutes on each side until charred on medium-high heat. After, place in the oven for 15-20 minutes. Let rest for 10-15 minutes and slice to make into chops. Serve with your herb yogurt sauce. Enter a special giveaway with American Lamb in honor of Lamb Lover’s Month here and enter to win a $1,000 hotel voucher! * This post is brought to you by American Lamb. Thank you for supporting the sponsors that allow lindseyeatsla to create new recipes and content. All ideas expressed are my own. 5 ingredient bacon wrapped asparagus ~ all you have to do in bundle your asparagus with bacon. Sear and grill, put in the oven topped with shredded parmesan for cheesy and nutty goodness. Then just drizzle with balsamic and lemon zest. + done! Made with Farmer John bacon, this recipe is a great easy and quick meal for a snack or dinner! (not to mention it is totally keto friendly). Farmer John makes it easy to eat a well-balanced diet and has so much versatility with their products. Preheat your oven to 400 degrees. Take your bacon slices and wrap around 4-5 asparagus with it. Heat a pan on medium high heat and grill your bacon on all sides until crispy. Top your asparagus and bacon with shredded parmesan and place in the oven for about 5-10 minutes. Remove and season with salt and pepper and drizzle on balsamic and lemon zest. Farmer John products are available at local grocery stores including Smart &; Final, Stater Brothers, Albertsons, Ralphs, and Northgate. *This post is brought to you by Farmer John. Thank you for supporting the sponsors that allow lindseyeatsla to create new recipes and content. All ideas expressed are my own. The dreamiest, crunchiest thai party wings eva! It’s all in the batter and the heat of the oil for this one - and it comes out SO crunchy. Pair with your favorite dip ( I love a good Nahm Prik Noom or Chili Dip). 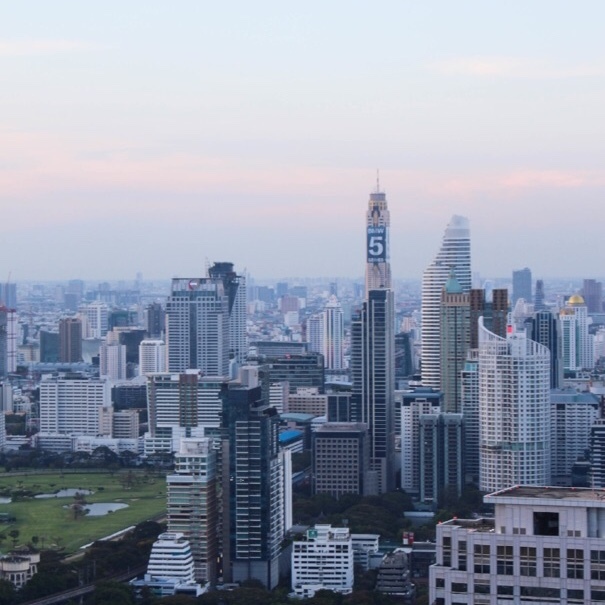 This recipe brings me back to Thailand like crazy! (you can find these on almost every corner). And this was one of my favorite things to eat in Thailand with sticky rice. Make your tempura frying batter by mixing tapioca flour, white rice flour and all purpose flour. Mix well. Slowly add in your seltzer and mix well so there are no lumps. If you see the batter is too watery, add more flour. Dredge your chicken in the batter and fry in HOT canola or vegetable oil until super crispy and fried and cooked on the inside (around 10-15 minutes for the party wings). Serve with your favorite dip and/or rice! One of my favorite soups is Tom Kha! It’s creamy, coconut-y and so versatile. (you can add shrimp, tofu, or chicken!) up to you. You can easily make it vegan or vegetarian. Not only that, it can be made in no time with barely any prep - it’s seriously the best. Start by sautéing and sweating out your onion and mushrooms. Add your coconut milk, vegetable broth, galangal, lemongrass, kaffir lime leaves, thai chiles, salt and fish sauce. Let simmer. Top with lime juice at the end, chili oil and cilantro. You can add shrimp or chicken as well, and also I sometimes like to add tomatoes! Winter has finally arrived and I am celebrating with this butternut squash and apple soup topped with cinnamon caramelized apples. It’s vegan, gluten free and made with a base of coconut milk (hello, extra creaminess!). Even better, the soup contains less than 10 ingredients and can be prepped in no time! Heat a pot with a drizzle of olive oil. Add your onions, garlic, ginger, cubed butternut squash and cubed apples and let everything sauté for 10-12 minutes. The Autumn Glory apple’s are naturally sweet, caramel flavored with notes of cinnamon that are perfect for this recipe! Next add your coconut milk and vegetable broth. Season with salt, pepper and sugar as needed. Let the components and liquid simmer for about 30-45 minutes until the squash and apples are fork tender. In the meantime, start to make your caramelized apples. Place a drizzle of olive oil in a skillet and add your apples, cinnamon and brown sugar. Mix every 1-2 minutes until the apples are caramelized and the brown sugar and cinnamon is cooked through the apples. Set aside. Place your soup mixture in a blender or use an immersion blender to blend the soup until all mixed through and creamy. Heat on medium-low and season as needed. Serve and top with your caramelized apples! * This post is brought to you by Autumn Glory apples.Thank you for supporting the sponsors that allow lindseyeatsla to create new recipes and content. All ideas expressed are my own.